The word heart has a fairly wide range of some interesting meanings in various cultures. In the West, having a heart is quite often equated with love and sentiment. My heart went out to him is a common metaphor for compassion. Being cold hearted would be an absence of these qualities. In the martial arts, possessing heart (shin) is considered honorable and dignified. A strong heart is the hallmark of any warrior. Many practitioners say they approach their training with a love/pain disposition. I think everyone knows the tremendous capacity the heart has for both love and pain, a duality which is best expressed as passion. But more than the seat of human emotions, I believe the heart bears an intelligence beyond our own. The heart understands where the ordinary mind cannot. The heart has been the inspiration for a number of martial art concepts. 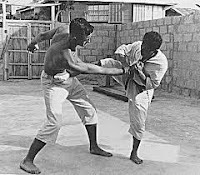 Isshinryu karate (One Heart Method), and Yi Quan (Chinese Intention Boxing) are examples of styles founded on the idea of shin/yi - the warrior's heart. Intention is woven into the fabric of the ethereal heart. Mind is yet another aspect of shin, as in mushin (selfless mind) and zanshin (the aware mind). One needs a clear, attentive mind to be able to listen to the workings of the heart. Clearly, the Eastern/martial model of the heart makes for a fascinating contrast to the Western/romantic version. "One needs a clear, attentive mind to be able to listen to the workings of the heart. " Oh yes! That is so true! Many times our mind will cloud, and confuse the real language of our hearts. We sometimes refuse to hear the truth within us because we "think" too much. Your statement has such a ring of reality to it! Thank you. The best thing I have done for myself in recent years, is to take up the standing practice of YiQuan, Zhan Zhaung. A branch of YiQuan is practiced in Japan, and is known as TaiKiKen. In TaiKiKen, the standing practice is known as ritsuzen, or standing zen practice. While there are a lot of different exercises to do in the standing practice, using different visualizaitons, I spend most of my time "just standing." "Just standing" settles the "monkey mind" and is the gateway to all sorts of benefits. If I don't take another step along the path of martial arts, I will continue the standing practice for as long as I can. The ramblings of the ordinary mind is the real enemy within. Thanks for your kind words. Standing meditation -- I've heard of that. The zazen method favored by Japanese budoka utilizes the yogic postures with the crossed legs, but is that really necessary? The important thing is to purge out the "monkey mind". Zen and the martial arts are interwoven. I just do standing. I don't think the sitting method has anything superior to show. You're very right about the two different ideas about "heart." The west has it all messed up. I like this post as I can really relate to it. It just brings some perspective to me as to what it is about the martial arts that I feel deep inside. Sorry I've missed your blog for a while. Right. The Western view of the heart is somewhat limited. Thanks Miss Chris. It's good to hear from you again. A fascinating contrast, as you say. Clearly shows how young we are over here. Although the heart concept is used in both ways around here too. A lion's heart. A king's heart. And the old expression : Put your heart into it. Which can be used for a love affair as much as a fight to the death. What motivated such a change? From courage, to love. Culture? Stories? Both? The "old" ways are mostly lost over here. Weird how modernity came through us in japan and how much we affected karate - martial arts - and how much they have an effet on us. They teach us to look back and we teach them to look forward. Now, if we could apply the same effect globally, to money, industry and well... everything. That would be a very good thing. Mat: I agree with your statement about Japanese words. The way I see it is that the Japanese don't really speak in words in the traditional sense. They speak in ideas and ideals. I know that pretty much any language is the same thing, but sometimes it just doesnt seem that way. It could be that I am just so used to speaking English that I sometimes miss the fact that I to, am speaking in ideas. When it comes to Heart, I do think of the "Eastern" idea, but that mainly comes from a Japanese drill instructor that I had in the army. He was quite an amazing individual. he was always preaching about Spirit and Heart and the way it should apply to our lives. John: Good Lord man... why aren't you writing for some serious publications man? Your blog is always an inspiration to me and I know, to others. Ienjoy reading every word. It always gives me plenty to meditate on. I agree with Oniyagi - you write really well, John. Funny, I had to think about this one for a while before I could reply to it - especially the bit about training in the Martial Way and love and pain. I think the divisions between heart and soul and mind and body are all artificial in a way. Our hearts are as big as our souls. We think with our bodies as much as with our minds. I think the Eastern way of thought really gets this - it's evident in a lot of healing (and hurting) practices. You have to heal the spirit and the body will follow. We train the body and the spirit follows. We train the heart and the mind has to hear. Love and pain. Yin and yang. If you notice, some "heart" expressions tend to be masculine when attributed to somebody. But to actually describe something heartfelt becomes feminine. Or sometimes both. If you think about it, training in the martial arts - for the fervent practitioner - is a love affair of sorts. Training the body is training the spirit. And you're quite correct about artificial boundaries between mind, body, and spirit. I also agreed with the comment that said that you should write for a publication of sorts. (I'm still around, sort of. The blogs went bye-bye; I tried and tried but just don't really have the time for it.) I'll still be checking in on you periodically. I like what I learn at your blog! Good to hear from you. Thanks for stopping by -- don't be a stranger! This encompasses the ability to remain in the moment with mushin and zanshin. Practice is that training that takes us to that moment and only that moment allowing us to develop the Tao which is that entity or Chi that is created from the Tao.